Product prices and availability are accurate as of 2019-04-04 00:59:11 EDT and are subject to change. Any price and availability information displayed on http://www.amazon.com/ at the time of purchase will apply to the purchase of this product. The Honeywell RPLS730B1000/U allows you to wire your lights, fans and other devices through a timer switch that can help save you money while adding a level of convenience and safety to your home. 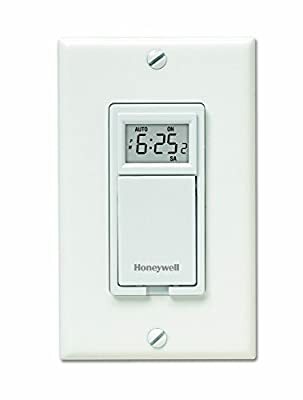 Compatible with LED and CF Bulbs, this easy-to-install Honeywell 7-day programmable timer switch handles motors, all types of lighting (compatible with electronic ballasts, compact fluorescent lights and tungsten lights up to 5 A), and offers the flexibility of 7 programs per week. The LCD screen shows time, day and load status. Manual override enables load to be turned on/off without affecting program. The unit comes with a built-in rechargeable battery and the programming is protected during power outages. LED compatibility requires neutral wire for operation. To be precise, this light switch timer functions on a 120 Volt line wire, load wire, one neutral from line side and one from the load side joined together with a wire nut. Once these components are connected with the timer, the Honeywell RPLS730B1000/U will have LED compatibility. It's also important to note that the wattage of the LED bulb should not exceed 1800 Watts.